All month long we’ve been teaming up with talented designers and top craft companies to bring you new crafts and giveaways. Sadly, as National Craft Month comes to a close, there are only two more special blog posts like today’s Project of the Day. Then we return to our regular scheduled programming – which will still deliver giveaways, project ideas, news and more! But let’s live in the present, shall we? Today’s Project of the Day will cheer us right up! 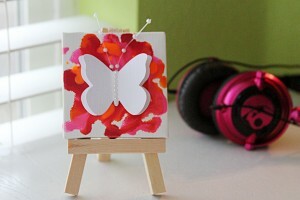 You’re going to love the Mini Butterfly Crayon Canvases from Consumer Crafts we’re about to share with you. It’s a fun, easy project that even the kids can get in on. Celebrate spring with this bright colored craft! Once you’ve read about our Project of the Day, scroll to the bottom of this post and answer the question in blue. By simply leaving a comment in the comments section, you’ll be entered to win today’s giveaway. 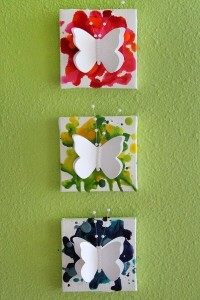 Nothing says spring like butterflies and bright colors! 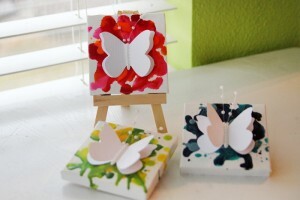 Celebrate the season with the Mini Butterfly Crayon Canvases. 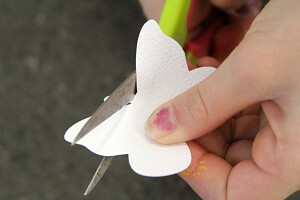 This craft is so simple, you can even let the kids help. Once they’re completed, they’re perfect to hang on the wall of a child’s bedroom or really anywhere in your home. Follow these simple steps and you’ll love the results. It’s a cheerful craft you can make yourself. The first thing you need to decide is your color palette. I chose the whole rainbow! I split the spectrum into three sections: Red/Orange, Yellow/Green, and Blue/Purple. I found it worked well to use 3-4 colors per canvas to get a good variety of color. 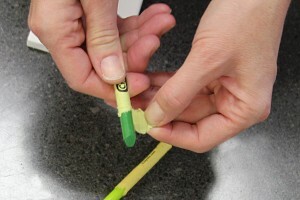 Peel back and discard the paper on the crayons you wish to use. Take off and discard the plastic coverings on your canvases. Place a piece of scrap paper underneath your canvas, to keep your work space clean. 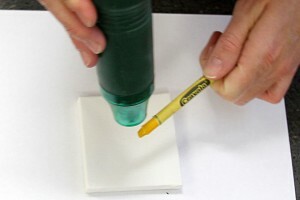 Hold your heat gun over the top of the tip of your crayon, and allow it to start to melt. 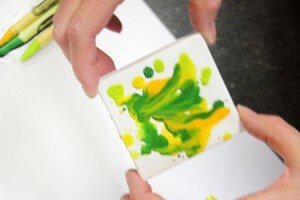 Let the drips from the crayon cover the canvas as desired. 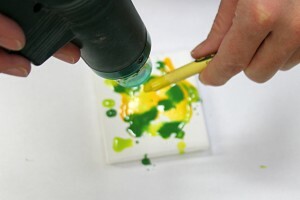 Keep in mind, the heat from the heat gun will keep the crayon on the canvas liquid, and the drops on the canvas will spread. Add additional colors as desired. Keep adding color, and let the colors mix and swirl. 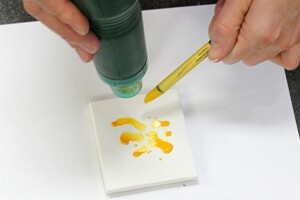 While the crayons are still molten on the canvas, you can tilt the canvas, and allow the crayons to mix and drip. I let mine drip right off the side of the canvas! 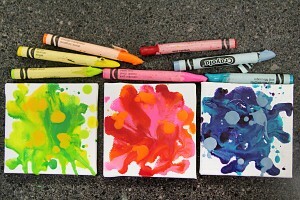 Look how cool the texture of the canvas is with the melted crayons! Let the canvas dry, and the crayons harden. 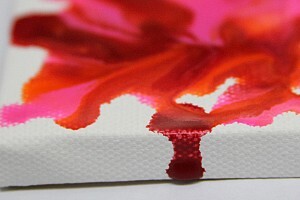 Then you can add color splatters to the canvas. Heat the crayon away from the finished canvas. This will keep the color already on the canvas from re-melting. 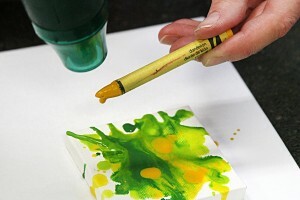 When the crayon starts dripping, hold the dripping crayon over the canvas, tap it, and allow it to splatter! Repeat with your other canvases, and your selected colors. Let the canvases dry. It doesn’t take long. 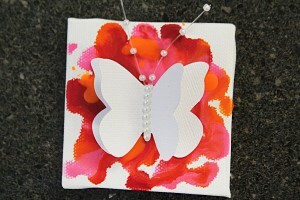 Using white Core’dinations cardstock, and a large butterfly punch, punch two butterflies per canvas. Trim the antennas from the butterflies. 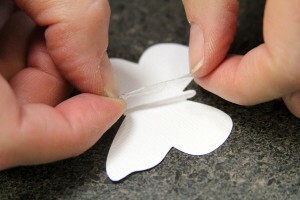 Take a glue dot, and stretch it out to cover the body of the (bottom) butterfly. Trim two strands of the pearl sprays from the bunch, and place them in the (stretched) glue dot. 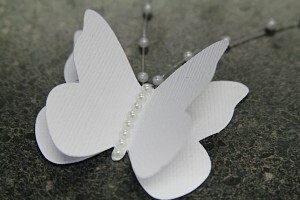 With your second (top) butterfly, bend the wings upwards at the body section, and adhere it to the bottom butterfly, using the stretched glue dot. 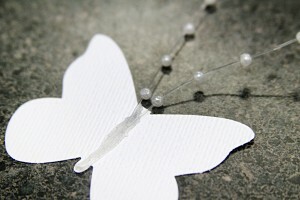 Add a strip of adhesive Bling pearls down the center of the butterfly body. 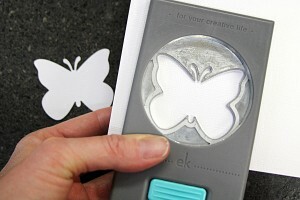 Adhere the finished butterfly to your finished canvas using glue dots. Trim those pearl spray antennas as desired. Either way, you might have to sign the bottoms of those canvases, because people aren’t going to believe you actually made them yourself! Contest closes March 30, 2012 at 11:59p CST. What have you enjoyed most about National Craft Month? Have you picked up on any new craft tips? Did you create anything new from the projects you’ve seen in our Project of the Day posts?